Biking in Orange County, where he grew up, is a wholly different experience than biking in Los Angeles, according to Bui. Most major streets in Orange County have bike lanes, unlike in LA, where streets are older, more congested and generally less accommodating of cyclists. Bui pointed to Irvine as a specific example of an Orange County city that was mass planned. Virtually every street in Irvine has a bike lane. The fact that most Orange County residents don’t often ride their bikes despite the multitude of bike lanes in their area is ironic to Bui. Given that Orange County is a spread out, suburban region, most residents opt to drive. There are a few areas in Orange County that lack bike infrastructure, however, such as parts of Santa Ana. Such neighborhoods, in which many residents bike out of necessity rather than recreationally, are the areas that need bike infrastructure the most, Bui said. 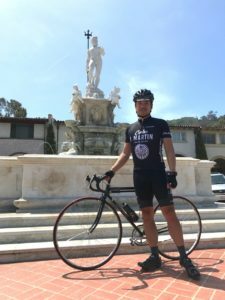 As a cyclist in LA, Bui plans the times and locations of his rides strategically, opting not to ride when he is most likely to encounter a lot of cars. Cyclists, who ride at 15–16 miles per hour on average, are constantly at odds with impatient drivers who may not accord them the respect and space they are entitled to. In the event of a collision, cyclists are almost always held responsible — a tendency that Bui finds unfair. Bicycles are smaller, slower and have less of a claim to “vehicle” status. Even motorcycles, with license plates and mandated insurance, are treated more like cars. The common narrative, Bui continued, is that the driver is never at fault. In the event of a collision, drivers can claim that cyclists were being unsafe, and the police usually have little incentive to take the side of the cyclists. Bui believes increased education for both cyclists and drivers is necessary. Cyclists need to know how to ride on the road safely, he said, while drivers need to understand and respect cyclists’ right to be on the road. Although Bui himself is not involved in bike advocacy, his passion for cycling has given him a different perspective as a driver. He now tries to be more considerate of cyclists on the road. Bui sees LA Metro’s Bike Share program as an excellent way to encourage cycling, but noted that those unaccustomed to navigating the city by bike may be hesitant to actually utilize the available bicycles, especially given LA’s general lack of bike-friendly infrastructure. Additionally, inexperienced cyclists often have a “fear of the rear,” wherein they lose focus while riding on the street out of a fear that they will be rear-ended. It’s safer for cyclists to ride in the center of the lane so that cars avoid them, Bui said. Riding close to parked cars can be more dangerous because it puts cyclists at risk of being struck by suddenly-opened car doors. Parking protected bike lanes, part of the Great Streets initiative, are a crucial step in making the city more accessible to cyclists. They are gradually being implemented on streets around LA, including on Spring Street. But although such bike lanes improve cyclists’ transportation routes, many community members are resistant to change. Drivers oppose the bike lanes — especially ones created at the expense of a lane of traffic — fearing that they will increase overall congestion. Filmmakers who shoot scenes on such streets dislike the green paint demarcating the lanes, insisting that it is ugly and must be edited out in post-production.